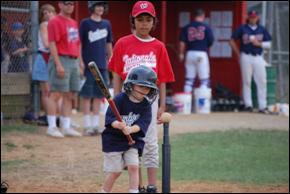 Herndon Optimist Youth Baseball (Cal Ripken Baseball) welcomes you to the 2013 season of Bambino Buddy Ball. 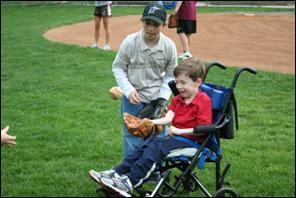 The league is for children 6-15 years old who have special needs or disabilities. The Herndon Optimists sponsor the program as part of their mission to encourage the development of youth and they welcome youth and adult volunteers to join the effort. Bambino Buddy Ball is chartered by Babe Ruth baseball and is proud of its strong partnership with League Sponsor Network Depot. According to the 2000 US census, at least 400 people between the ages 5-20 who have disabilities live in the Town of Herndon, with hundreds more in surrounding areas. Buddy Ball strives to make baseball accessible to young people who typically are not served by conventional sports programs. The Herndon Bambino League is a transforming experience for the players and the buddies who work with them; making memories, teaching life lessons, and building lasting friendships. Bradley Hatfield having a great time practicing throwing and catching with buddies Greg Ruvolo and Brendan Eyerman (not pictured). Buddy Ball pairs players with volunteers from the Herndon Cal Ripken and Babe Ruth baseball leagues and the HOYS girls’ softball league, who receive instruction in how to work and communicate with children with disabilities. The game combines elements of tee ball, coach-pitch, and kid-pitch to accommodate children of varying skill levels. Our mission is to have fun, build confidence and self-esteem, and teach sportsmanship and love of the game. We use trained coaches and umpires, and players are able to experience the thrill of making plays, getting hits, and rounding the bases. The 2013 season begins with Buddy training sessions on TBD April. Players report for preseason practices on TBD. The season includes 8 games over 9 weeks, ending on TBD. (See link to 2009 calendar.) Games are played on accessible Herndon fields. Player uniforms and registration (hats and shirts) are free. Eamon Clark making contact under the watchful eye of buddy Julian Castorena during the Bambino’s outing with the Herndon Braves collegiate team. Special events include a season-opening pizza picnic for players, families, and buddies; a “twinight” game at the Bready Park complex, complete with lights, announcers, music, and National Anthem; an outing with the Herndon Braves collegiate team; a season-ending party and trophies; and a trip to see the Washington Nationals take on the Toronto Blue Jays. Buddies should complete a Buddy Availability Form to help us plan buddy support for each game. A follow-up form is available to parents for describing their player’s disability or special need; for elaborating medical concerns, accommodations, or helpful tips for communication and, where appropriate, to provide contacts for further guidance and advice. (See links to forms below). For additional information, please contact Commissioner: . Here is the Calendar for the Buddy Ball Spring 2010 Season. Event times and places may change, so check back here to confirm.